Apulia accounts for 16% of Italy’s wine production (2nd in volume among the regions). Red and Rosé wines account for slightly more than half of Apulia’s production. The region, which forms the heel of Italy’s boot, boasts ancient winemaking traditions. During the Roman Empire, its wines were exported throughout the civilized world. Renaissance leaders, such as Lorenzo il Magnifico, were impressed by Apulia’s wines, and after the French occupation of Italy, huge quantities were shipped to France. Apulia is now bringing its wines to a new high standard of quality, implementing recent large-scale renovations to the wine sector. 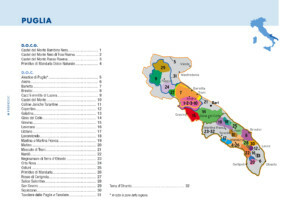 Apulia can be divided roughly in two viticultural sectors between Brindisi and Taranto. The northern area enjoys a temperate climate producing dry wines with impressive fruit and good acidity. Red wines from the north generally derive from the native Uva di Troia (aka Nero di Troia) or Bombino Nero, as well as Primitivo, Aglianico, Montepulciano and Sangiovese. White wines are dominated by the Verdeca variety, but many of the grapes also found in Campania can be found here. Southern Apulia contains the Salento peninsula, characterized by low rolling hills and a hot climate. Salento’s traditional wines were the powerful, inky reds from Primitivo, Negroamaro and Malvasia Nera. These grapes characterize the wines of local appellations Primitivo di Manduria DOC and Salice Salentino DOC. However, increasing attention is being given to fresher reds and rosés, as well as to some unexpectedly bright and fruity white wines, often showcasing Chardonnay, Malvasia Bianca and Verdeca.